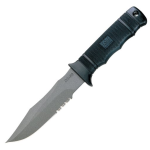 If you are seeking a survival knife fit for a king, you may not wish to settle for anything short of the Morakniv Bushcraft Survival knife, a small but remarkable tool recommended by outdoorsmen, survivalists and even the King of Sweden. Happily, you won’t have to pay a king’s ransom for the Morakniv Bushcraft, even though it’s been manufactured by the same Östnor-based company for over a century and has quite a reputation for quality and endurance. But despite its international reputation for excellence, you must still figure out whether it meets your own standards before picking the Morakniv Bushcraft over competitors. The following information should help. Construction: Can you imagine a knife maker–with a reputation that goes back to early 20th century Sweden–skimping on construction? According to loyal Morakniv owners who wouldn’t consider another brand, no detail is spared when manufacturing these iconic knives. Owners don’t experience grip problems thanks to the textured rubber material that’s practically indestructible, so even if you intend to spend your days hacking underbrush or cleaning fish, this knife won’t disappoint. 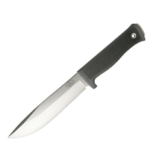 That stated, like many knives produced for the mass market, the handle on this knife is designed for medium-size hands, and so if yours are particularly beefy or small, you could find this knife a bad fit. Otherwise, adjust your grip, the way fans of current Bushcraft Survival Knife owners do. Enjoy exacting thumb control enhanced by the jimping design atop the handle and a front quillon establishes a solid contact point. 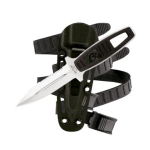 The sheath features both clip belt and full loop. It pivots freely (360-degrees) so it never cramps your style. A hole at the sheath bottom allows everything from slime to water to drain effortlessly. Does this mean construction is perfect? Not for those who can’t live without tang construction, so if you’re looking for an excuse to buy another survival knife, the modified rat-tail construction of the Morakniv could be a game changer. Bottom line: Fans buy the Morakniv knife for ergonomic excellence, a universal compliment that shouldn’t be discounted if you count on your knife for myriad challenges. Blade. At 4.3-inches–with an impressive thickness of 3.2mm–the blade tip of the Morakniv Bushcraft survival knife tapers down to a ¼-inch bevel, the typical design used on all knives manufactured in Scandinavia–and that bevel runs the length of the blade. Whether you pick the tungsten-coated carbon or stainless steel blade, both perform admirably no matter how difficult your task may be. You will appreciate the spike-like tip reminiscent of ice axes Norsman used to plunder and pillage during the heyday of Viking conquests—it begins around 1.5-inches from the tip to eliminate breakage. As one Morakniv fan said, drive that point into everything from cans to plywood and it comes out pristine. Need to cut metal? Done and done. While some purchasers complain that Morakniv knives have had back edge issues in the past, the problem has been ironed out by the manufacturer, and you don’t have to worry about discoloration if you choose the tungsten coated model; wipe the blade off with a paper towel and you’re good to go. Is the blade perfect? Depends on your perspective. Carbon steel can cause corrosion when wet, so if you choose this knife attend to the blade fast—even if all you do is wipe it down on cardboard. Re-sharpening? A breeze. But don’t expect to do it frequently; the edge of this blade stays sharp longer than most. 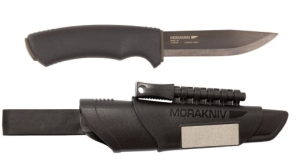 Paper: One reviewer said the Morakniv gave him the most impressive results he has ever seen when slitting newspaper, while another owner reports no problem with the first 100 linear feet of cardboard before the blade began to under-perform. Rope: “A rope slicer’s dream,” said an owner raving about razor sharpness, firm grip and solid leverage. He experimented with rope and was delighted by results achieved on polyethylene, nylon and sisal. Climbing rope that usually requires a saw performed like a dream thanks to the Bushcraft blade. Culinary. If you perform gastronomic feats in addition to leisure time activities, the traditional Scandinavian-ground blade can perform wizardry whether you’re slicing and dicing veggies, meat or wild trout. The Morakniv is impressive when processing game and meats. One reviewer experimented on frozen ribs and called the cutting process effortless. Wood: All woods are not created equal—but one owner had to eat his words after testing everything from walnut to plywood using a Morakniv Bushcraft and finding every cut to be perfect. Brush: The Bushcraft won’t disappoint. Slice and dice branches, attack vines and saplings with equal success—in fact, this knife has given machetes, brush blades and chainsaws a run for their money. 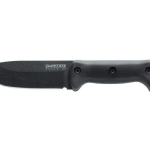 The Pros: You’ll find no better edge than the one maintained on a Morakniv Bushcraft with very little maintenance and you might be shocked to discover that the price of this survivalist knife is downright affordable. 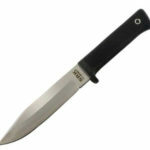 You will like the grip, the feel, the performance and the versatility with which this average-size knife comports itself. Take the recommendation of happy owners—and the King of Sweden—by adding this knife to your arsenal. The Cons: Finding negatives about the Morakniv Bushcraft is no easy job but we’ve unearthed a couple of complaints: First, it’s not the sort of tool you would be eager to display in a trophy case because it’s more utilitarian than beautiful. Next, if you’re a stickler for a pristine surface no matter how you torture the blade, you might not like its tendency to attract corrosive elements if you choose carbon steel. If your hand is big, you could also encounter grip gripes, but if that’s your only complaint, consider yourself the newest member of the growing international Morakniv Bushcraft fan club.